It is a 5W Adapter/Power Supply Module/Voltage Regulator, Input voltage: DC 7~20V, Output voltage: D.. It is a 5W Buck Converter/Voltage Regulator/Adapter, Input Voltage: DC 6.5~24V ( if input greater th.. It's a Digital Constant Voltage/Current LED Driver Module,Input voltage: DC 6V ~ 40V,Output voltage:.. It is a 60W Power Supply Module/Adapter/Power Converter, Input voltage: DC 24V (17V~35V), Output vol.. It is a 60W Power Supply Module/Adapter/Driver/Charger, Input voltage: DC 5 ~ 30V, Output voltage: D.. It is a 60W Car Adapter/Power Supply Module/Voltage Regulator, Input voltage: DC 24V (17~35V), Outpu.. It is a 75W Voltage Regulator/Car Converter/Adapter, Input voltage: DC 12/24V (9V~35V), Output volta.. 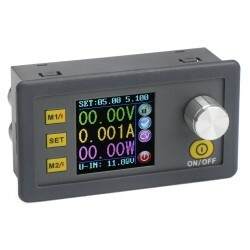 It is AC0.1~100A LCD Display Digital Ammeter Current Monitor/Tester, Working Voltage: AC80~500V 11.. It is a 75W Buck Car Adapter/Voltage RegulatorPower Supply Module, Input Voltage: DC 60V(8V~75V), Ou.. It is a DC Buck Converter,Input voltage : DC 4.0 ~ 38V,Output DC 1.25V ~ 36V,Output current: max 5A,.. It is a 75W NC Power Supply Module/Charger/Voltage Regulator, DC 6~32V, Output voltage: DC 1.25~32V,.. It is a 75W Power Supply Module/USB Charger + Digital Meter, Input voltage: DC 6~32V, Output voltage.. It is a 9.6W Power Converter/Adapter/Switching Power Supply, Input voltage: 90V to 240V AC 50HZ/60HZ.. It is a 90W NC Programmable Power Supply Module/Charger/Adapter, Input Voltage Range: DC 5V～40V, Out..